I’m starting to find young dyer’s polypore (Phaeolus schweinitzii) in the forest, so they’re giving me some very rich golds, made even richer by the afternoon light. I made another dyepot using grey fleece, Corriedale roving and a handful of Tencel. The colour didn’t turn out to be quite so vibrant, but rich nonetheless. 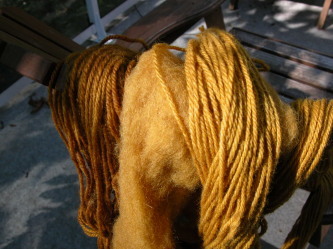 Last year I dyed mostly commercial yarn because I was more interested in seeing the wide range of colours I could get. 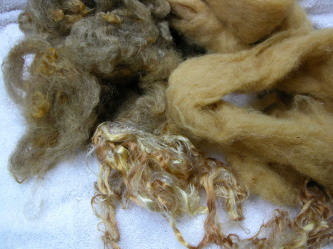 This year I plan to dye more unspun fibre so I can play with them at the spinning wheel. Now it’s out for a foray in another part of the forest, a friend, my dog, and me. Can’t wait to see what you find ! I’m hoping to go foraging for mushrooms tomorrow just behind where I live. There are lots up there….now to try and figure out which ones will be good for dyeing.